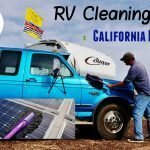 Some of the most often ask questions I get from readers of Love Your RV! 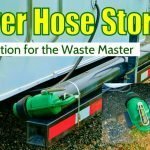 are regarding trailer tires. 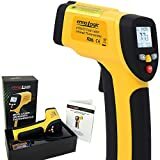 Things like “What brand do you use?” “How old is too old?” “How much PSI do you inflate to?“, etc. 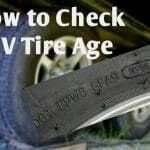 I’ve always been leery of writing a tire advice post since they are such a critical part of safety and I’m frankly no expert on the subject. The issue always stirs up passionate debates on web forums. You’ll find many varying staunch opinions. However, there seems to be considerable interest in the subject, particularly from new trailer owners. So, I’ve decided to sit down and write a comprehensive blog post to share with folks. In it, I’ll detail what type of tires I’ve used and tips/advice to hopefully avoid the dreaded blowout. 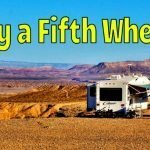 I’m happy to say in my six years of full-time RVing and over 60,000 miles towed I’ve never had a flat or blowout to a trailer tire. Smart or just plain lucky? Likely both, I don’t know but knock on wood! What Brand of Trailer Tires Do I Run? Our fifth wheel is a 2011 Keystone Cougar with a GVWR of 10,400 lbs. It came new from the dealer with 4 Power King Towmaxx STR tires model ST225/75R15 Load Range D (8 Ply). We used them to circumnavigate the US and Canada during our first year without issue. So when the time came to swap them out after around 15,000 miles due to worn down tread, I replaced them with the same brand. One important change I did make was to move up a load range from D to E. This gave me two extra plys and upped the max PSI from 65 to 80. I noticed a large difference with stiffer sidewalls reducing tire bulge. Towing seemed smoother especially when cornering and I gain extra load capacity. I believe this has been the best thing I’ve done to lessen my chances of a damaged tire or blowout. The second set of Towmaxx tires lasted nearly 20,000 miles. When the time came to replace them, I wasn’t near any Towmaxx dealers so ended up on the advice of a tire tech installing a set of Saffiro tires with the same specs. He told me the local ranchers had good luck with them. They performed well for me for another 20,000 miles before the tread wore down again. Just last month it was time once again to purchase new tires. We were headed back home from snowbirding down south and would be facing a lot of rough roads on the long return journey. My timing was perfect as Goodyear just released a new tire called the Endurance. At $560 for all four including installation, it was right in our budget. Two things excite me about this particular tire. Goodyear makes them in the good old USA, and they have a max speed rating of 87 MPH. My previous tires were out of China and had a max speed rating of 65 MPH. So far so good, I put them to the test on the way home on some rough California freeways and the often twisty highway 101 up the west coast. They performed well, smooth towing with no loss of air the whole trip. 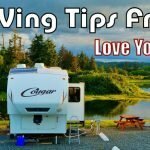 The following are the key tips I’ve learned over the years to keep our trailer tires rolling without failures. 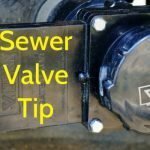 Proper Inflation and Inspection – Before every towing trip I quickly check the PSI of each tire and inspect them for damage. 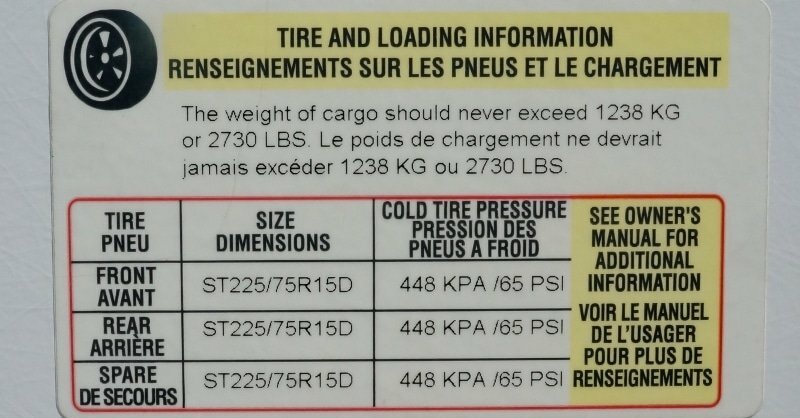 The sticker on the trailer recommends 65 PSI cold tire pressure meaning measured the morning before travel. When I moved up to an E load range tire, I had a decision to make. The E tire had a higher max PSI rating. Some folks say always run tires at max PSI while others say inflate tires for the load they are carrying. After consulting with several tire technicians, I decided to inflate my new tires to 72 PSI. 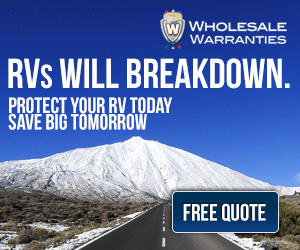 It would be more than enough to carry the load and provide an extra range of safety in case of minor air loss, hot weather, or elevation changes. Another thing to consider when setting inflation is how the tire will contact the road. Over inflated and it will wear faster in the center and under inflated it will wear faster on the edges. Neither is good as you want the maximum amount of tread contacting the road. I’ve heard some folks using a piece of masking tape across the tire and a short drive as a quick check. Level Trailer and Loads – Even though the tires are rated to carry a trailers max load there is more to consider. 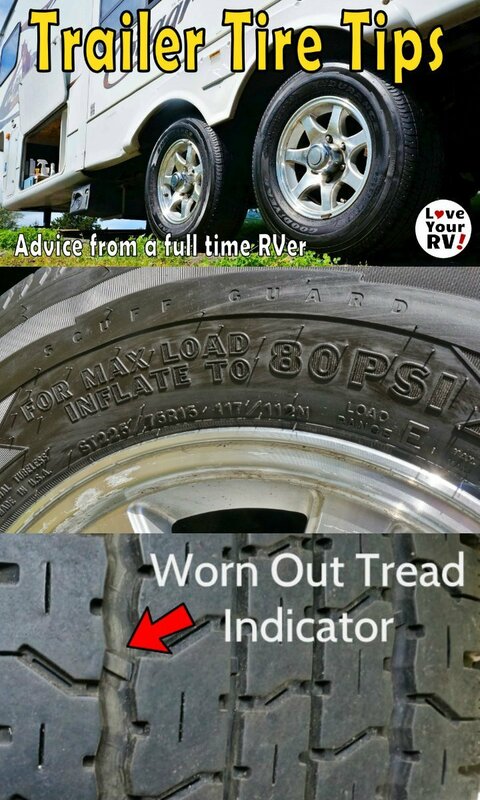 If a trailer is nose high or nose low, weight will be shifted more to one set of tires. Same applies if the trailer is overloaded in one area compared to another. Try to have the truck and trailer setup as level as possible and store heavy items evenly throughout the rig. For example: Say you have a trailer loaded close to its max GVWR (not that uncommon). Then tow it excessively nose-high with a bunch of heavy items on the rear bumper you could easily be overloading the capacity of the rear two tires. Add to that a big difference in side to side weight and one tire could be severely overloaded. Don’t Hit Curbs – I see it all the time, trailer towers cutting corners too sharp and running over curbs. Many times you barely feel it in the truck, but with a bit of speed, a tremendous amount of force is applied to the tires. If one or more of the internal steel belts is damaged, it may not show up right away but could lead to a blowout many miles later. Slow Down – Most ST (Special Trailer) tires on the market have a maximum speed rating of 65 MPH. However, I routinely see RVers blasting by me on highways doing 75+. Exceeding the speed rating for extended periods can lead to overheating and failure. Often I see these folks later on down the road pulled off to the side wondering why they got a flat. Guess they didn’t save much time after all. Check For Overheating – Spotting a failing tire before it blows is of course preferable. One way to prevent some failures is monitoring the temperature of the tire looking for changes. Every time we stop I do a quick feel of each tire and wheel looking for anything abnormal. You will find the tires on the sunny side a fair bit warmer but should be even with each other. Never should things be too hot to touch. Rotate, Balance and Metal Stems – I always have my new trailer tires balanced and have them install new metal filler stems. About half way through the life of the tire I have them rotated front to back to even out the wear. When to Replace Tires – I replace mine when the tread wears down to somewhere between 4/32 and 2/32 of an inch. Trailer tires aren’t steering or powered so they can have a bit more wear on them. 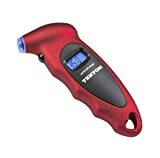 Inexpensive tire tread gauges are the best way to measure although you can find many tread depth tips that use a coin. My new Goodyear Endurance tires have a built-in tread wear marker. 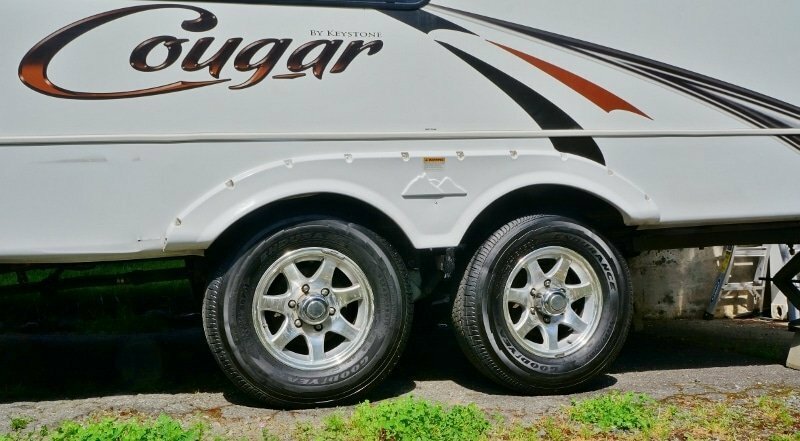 Conventional wisdom suggests replacing ST trailer tires every 5-7 years even if they look great with lots of tread on them. Tires can rot out from the inside without showing. If rotted like that when they blow they tend to peel apart and do significant damage to the wheel well area. In my mind, it’s just not worth the risk. 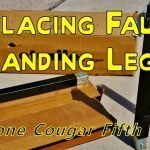 Long Term Parking – This is a subject I’m not overly familiar with, so I’m going off what I’ve heard others advising. Most say to cover the tires to protect from UV sun damage. Don’t have tires touching cement or asphalt, place wood boards under them. Rotate every few weeks to prevent flat spots from developing. Some even say to put the trailer on blocks and remove the tires and store inside. 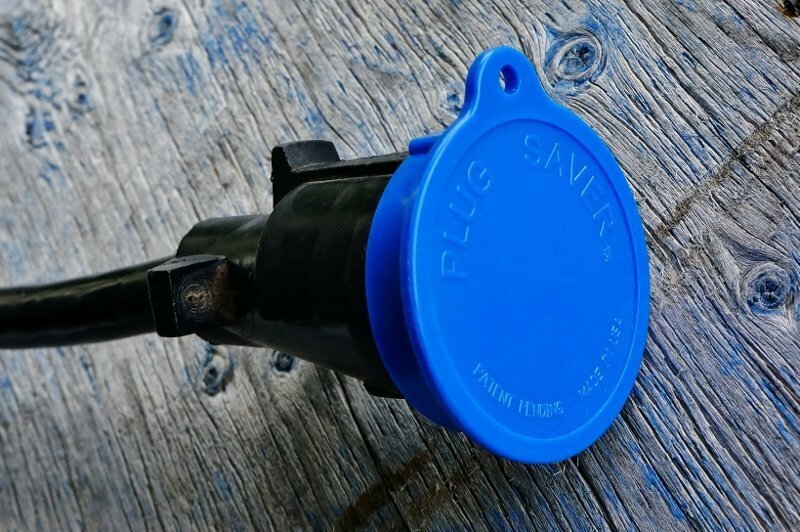 Install a TPMS – This final tip is one I’m seriously considering before we head out on our next extended RV adventure. A quality wireless Tire Pressure Monitoring System is pricey but I feel may be worth the cost. I’ve heard of too many tire failure horror stories. It seems the damage is rarely isolated to just the tire so the repair costs can add up big time. Some trailer owners decide to swap out their “Special Trailer” tires for “Light Truck” tires. Myself I’ve always stuck with ST tires, they have performed well for me, but I can see why a person would change over. LT tires generally have a higher speed rating, longer tread life, and a much better selection to chose from, especially for heavy trailers. 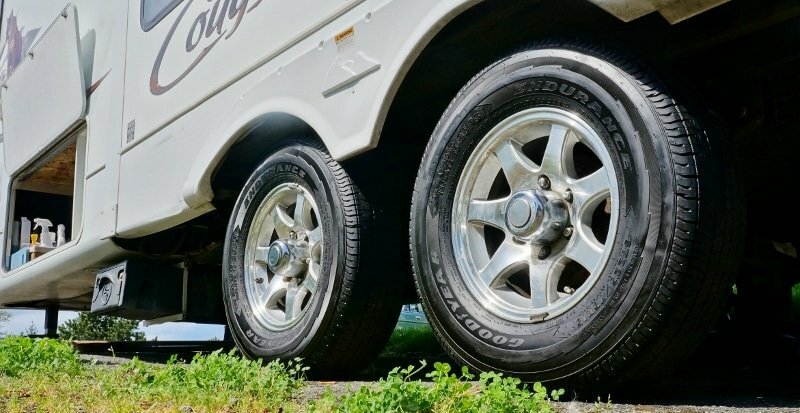 However, ST tires are specifically designed for the forces trailers put on tires. They have thicker sidewalls and a higher load capacity. When backing a tandem axle trailer in a tight turn a significant amount of sideways force is put on the tires. I’ve heard some trailer owners that switch over to LT tires have to also change to a larger wheel size. My advice, if considering the move is to do a Google search for “LT versus ST tires” and read over the reams of information and opinions. Then talk is over with a trusted tire shop. Also, keep in mind changing over could have implications for warranties or insurance.